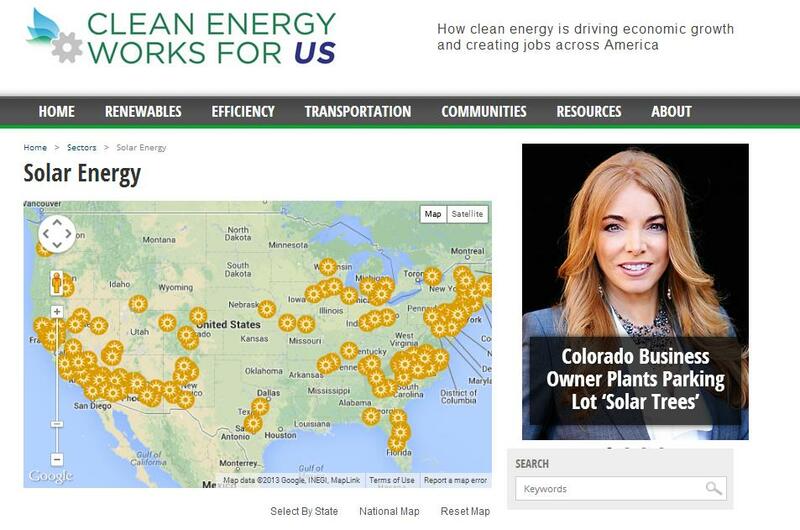 Cleanenergyworksforus.org is a project of Environmental Entrepreneurs (E2), a non-profit, non-partisan community of business leaders advocating environmental policies that promote jobs and economic growth. E2, an affiliate of the Natural Resources Defense Council (NRDC), has for more than two years been tracking announcements of job-creating clean energy projects across the country. The eye-opening results – displayed with interactive maps, text and video – show that clean energy alternatives are no far-off pipedream, but real, money-making enterprises that are creating profits for shareholders and tens of thousands of good-paying jobs in wind, solar, mass transit, energy efficiency and other sectors. In 2012, E.ON built three new wind farms in Texas and Indiana in 2012, creating 600 jobs during construction, 30 permanent jobs, and investing $1 billion in local communities. With 500 megawatts of combined generating power, these pollution free turbines will produce enough electricity to power 100,000 homes. E.ON is planning to spend $9 billion on renewable energy and environmental projection projects over the next five years. Solar power in the Mojave Desert: It gets pretty hot in Ivanpah, California — over 100 degrees on a typical August day. Oakland-based BrightSource Energy is harnessing power from the sun with a 377 megawatt solar complex. The three-plant complex, which was expected to employ 1,400 construction workers at its peak, uses mirrors to focus the power of the sun onto solar receivers. The Mojave desert plant – the largest solar facility currently under construction anywhere in the world — is projected to go online in 2013. Selling power to Pacific Gas and Electric and Southern California Edison, it will produce enough electricity to power 140,000 homes, while reducing greenhouse emissions by 400,000 tons per year. Mass transit, mass hiring: Americans took more than 10 billion trips on trains, busses and other forms of public transportation in 2012, the highest figure since 2008. Cities, states and the private sector are responding to public demand with new transportation projects, creating greener ways to get around – and also good-paying jobs. Charlotte, NC announced an extension of its light rail system in 2012, projecting as many as 7,000 construction jobs. The Maryland Dept. of Transportation is also expanding light rail, potentially adding 4,200 jobs. Florida East Coast Industries is expected to hire 7,000 workers to construct a new 200-mile passenger line from Miami to Cocoa. The Chicago Transit Authority (CTA) was expected to add 2,700 workers to repair and rebuild the system’s red line. Atlanta plans to create 1,399 jobs for a new streetcar project. Los Angeles is projecting more than 18,000 new jobs will be needed to build a new light rail corridor from the LAX airport to Crenshaw. Business leaders at E2 advocate for smart policies to empower workers and companies in emerging clean energy industries. You can follow E2 on Facebook or on Twitter at @e2org.